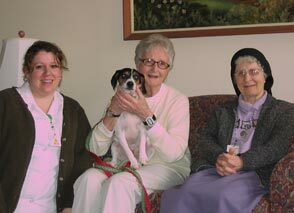 The Catherine Kasper Life Center Inc. (CKLC) is a ministry of the Poor Handmaids of Jesus Christ (PHJC). Located in rural Donaldson, IN, since 1922 the convent of the religious congregation of the PHJC, the PHJC Ministry Center, now known as The Center at Donaldson, was created in the mid 1980s out of the women religious’ recognition that they no longer required all the facilities for their own purposes. A decision was made to create an ecumenical space of welcome and ministry so that others could also benefit from and use their facilities. A variety of ministries were created; Catherine Kasper Life Center being one of those ministries. Catherine Kasper Life Center is nestled in a picturesque landscape overlooking Lake Gilbraith. The Catherine Kasper Life Center is a community dedicated to creating a joy-filled, safe, healthy environment where residents are assured that Christian values exist. It is composed of Maria Center — independent senior living — and Catherine Kasper Home, a licensed nursing facility. It also offers a variety of intergenerational experiences and activities, which promote physical, mental and spiritual well-being.